Green papaya Mixed with fish sauce And chile peppers You bet! 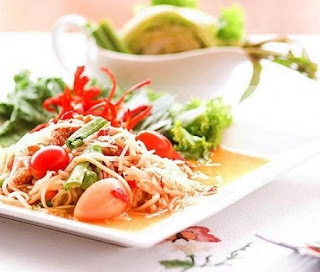 It is a wonderful traditional Thai side dish that is exceptionally good with barbecued chicken and other meat dishes. Combine the dressing ingredients in a small bowl except dried shrimp and set aside. Using a mortar and pestle, pound chilies and garlic to coarse texture. Add papaya, green beans, tomatoes and pound 1-2 minutes longer, mixing with a spoon while pounding. Add dried shrimps, peanuts, dressing and mix well. Serve immediately. Note: take care when you grate the papaya that none of the portion next to the seeds gets in since it has better taste. MethodMix the marinade, stir the wings until thoroughly coated and leave to marinate for 12-24 hours in the fridge. 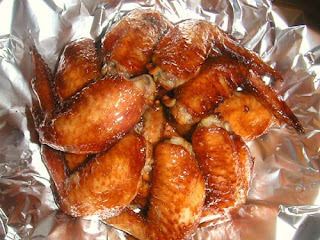 Barbecue or grill the wings over fairly high heat until cooked through. Serve with a dipping sauce that consists of 4 parts mayonnaise, 4 parts tomato ketchup to one part hot chili sauce. 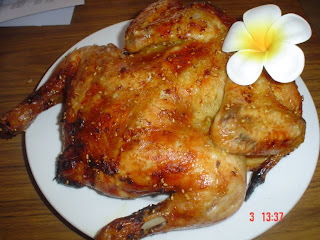 Thai barbecued chicken is a bright red color and full of amazing flavor. This recipe by Puangpen Prescott is no exception...make sure to have plenty of the dipping sauce on hand for other dishes as well. It is even great on chicken wings. Rub chickens with halved oranges or limes and follow with salt. Marinate chickens in the mixture of coriander root, pepper, garlic, light soy and wine for 2-3 hrs. Grill on medium low heat charcoal fire till done. The skin of the chicken should be crisp and light brown. Pound the first 4 ingredients together just till shredded. Add the last 3 ingredients and mix well. Beware this is very hot. You can reduce the amount of phrig khee hnu to tone down the heat. 1. Heat the oil in a wok or large frying pan. Add the green curry paste and sugar and cook over a fairly high heat for about a minute, stirring with the lemongrass, if using. Reduce the heat slightly and stir in the chicken pieces and lime leaves or zest until coated in the paste. 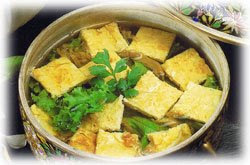 Add the coconut milk, fish sauce or soy sauce and bring to a simmer, cooking for 25-30 minutes until thickened slightly. Stir in the coriander and lime juice. Check for seasoning, adding more fish sauce or soy sauce if needed. 2. The curry is now best left to sit for a few minutes so the sauce becomes creamier. You will also taste the true flavours of the curry paste ingredients when it's slightly cooler. 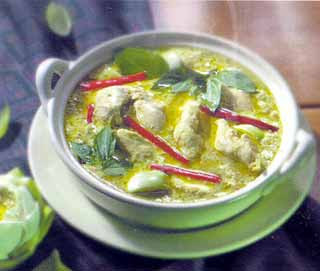 Serve with lots of fragrant Thai jasmine rice. 1. Bring the stock to a boil. If you wish to add pork, drop small lumps of the ground meat into the stock. 2. Beat the eggs and fry in a wok until firm. Now, move the egg off to one side, put in the garlic, and sauté until fragrant and golden. Next, return the eggs to the middle, break up with the spatula into pieces, transfer the contents of the wok to the pot, and when the stock returns to a boil, add the fish sauce. 3. Place lettuce leaves in a bowl, dip the soup into the bowl sprinkle with The pepper, coriander greens, and dried salted vegetable, and serve hot.